Proposition (1): there is no such thing as objective truth; all “truths” are culturally relative. If one believes that there are no objective truths, then it follows that nothing you can say is objectively true, not even the statement that “there are no objective truths.” What sort of statement, then, is Proposition (1) if it is not objectively true? Is it rhetorical hot air? Is it akin to fictitious statements in poetry or novels? If not, what? Moreover, why should anyone believe you? What justification do you offer to people to believe this proposition, if you do not even assert it as an objectively true statement? Even worse, if Proposition (1) were true, then it would follow that all the propositions of Postmodernism are not objectively true, but merely “subjectively” true within the Postmodernism subculture. There is no reason why hostile people from other cultures or subcultures need believe them. But why, then, when people criticise Postmodernist doctrines do the Postmodernists react with hysterical outrage and act like their core beliefs are objectively true and their critics are wrong? (1) why, then, should anyone who is not a Postmodernist believe the Postmodernist beliefs and what justifications can Postmodernists offer to their critics? What, for example, can the Postmodernists say to genuine Nazis to dissuade them from their beliefs? (2) it cannot evade the issue that we live in a mind-independent world with a high degree of regularity and consistency, and that language can refer to and represent that reality. If language can represent reality, then it is but a short step to the correspondence theory of truth and objective empirical truths. Let us start with (1). If Postmodernist truth relativism and cultural relativism were taken seriously, then it follows that all the “truths” of official Nazi culture – racism, authoritarianism, anti-Semitism, homophobia, and German racial supremacism – were valid within Nazi culture and Nazi culture was equal to all other cultures (for that is the clear consequence of believing that all cultures are equal). On what grounds, then, do Postmodernists object to the ideas of Nazi culture? How would they argue against it? They cannot, for example, argue that the Nazi belief that certain races are genetically inferior to other races is objectively false, for the unhinged Postmodernist core belief is that there are no objective truths (and that includes no objective empirical truths in science). Even worse, the Postmodernist associated belief is that all cultures are equal and of equal value. So, once one beleives that, it is not possible to object to Nazi culture on moral and aesthetic grounds (especially when moral relativism is also a tenet of Postmodernism!). As Searle points out, once we admit that there is an ordered reality independent of our thoughts about it, and that we can use language consistently to refer to objects and processes in that reality, then the other steps follow. Many of our words, and the concepts they represent, can and do refer to objective things in reality, and clearly many concepts we have (signified by words or sounds) are constrained, limited and defined by reality. For example, the modern English word “zebra,” as understood by competent speakers of English, cannot simply refer to hedgehogs: the concept signified by the word “zebra” really is constrained by mind-independent things we see in reality. Or, as some analytic philosophers would say, language can be isomorphic to thought (including concepts and ideas), and in turn language can indirectly correspond and refer to reality (Schwartz 2012: 182), as is also argued by modern linguists and in the discipline of evolutionary epistemology. Objective truth follows from the way language can describe or picture reality. This leads us directly to the most convincing theory of truth: the correspondence theory. And once we recognise the reality of objective empirical truths, we have a basis by which rational human beings can resolve their differences, settle disputes, correct errors and, above all, rationally deal with political, social, cultural and economic disagreements. By contrast, Postmodernists have no such strategy – all they have is truth relativism and cultural relativism, utterly intellectually bankrupt concepts. And I mean the anti-capitalist mentality of the Austrian libertarian cult and certainly in its Rothbardian form, because – make no mistake – these people are anti-capitalist in their core ideological beliefs, no matter how much we have to hear of their blustering nonsense. Rothbardians and many other Austrian libertarians oppose even private capitalist fractional reserve banking, but their arguments for doing so are utterly flawed, wrong or just plain ignorant. In truth, fractional reserve banking is neither inherently immoral nor fraudulent, but is a fundamental and indispensable basis of capitalism. You cannot have modern capitalism without it. In its ignorant opposition to fractional reserve banking, Rothbardianism and other Austrian economics following the Rothbardian view are actually profoundly anti-capitalist and (on their own principles!) would require coercive violations of private property rights and free contract to ban fractional reserve banking, if they were to implement their utopian anarcho-“capitalist” system. Because of their mistaken view in (1), Austrians and Rothbardians – whether they want to admit it or not – are logically committed to the view that business cycles are a core and inevitable element of capitalism. In essence, Rothbardians assert that, in to order to avoid business cycles, not only central banking but also private-sector fractional reserve banking must be abolished. However, as we have seen, fractional reserve banking is a fundamental basis of capitalism and is not fraudulent. It cannot be abolished without rejecting capitalism. Capitalism is stuck with fractional reserve banking. It follows that Austrians and Rothbardians (if they were honest) must admit that capitalism – since fractional reserve banking is at its heart – is inherently and badly flawed and naturally tends to produce business cycles in its laissez faire state. Laissez faire capitalism is therefore obviously not the best system we could have. And Austrians must therefore hold the view that capitalism is inherently bad. They are just filthy anti-capitalists like their opponents. Now let’s expand on these points. What is the major argument Austrians have against fractional reserve banking? The Rothbardians argue that fractional reserve banking is fraudulent because it supposedly involves two incompatible property claims to the same money “deposited” in a bank whenever one opens a demand deposit. However, this is simply a blatant falsehood, because when you open a demand deposit, you utterly forfeit your property rights to the money and transfer the ownership rights in the money to the bank. The money becomes the bank’s property. All you get in return is an IOU or debt instrument, promising to repay the debt owed to you on demand. Therefore there are not two property claims to the same money: there is only one. Every stupid and ignorant Austrian argument is dealt with above, from Huerta de Soto’s unbelievable errors on banking and the mutuum contract in ancient Rome to Rothbard’s gross misunderstanding of the court case Carr versus Carr (1811). When we get to the essence of the matter it is this: Rothbardians and their ignorant cult leader Rothbard tried to paint fractional reserve banking as an alien, unnatural and fraudulent addition to pure capitalism in its “garden of Eden” state, which was the reason for business cycles. Rothbard, of course, blamed “fraudulent” and “immoral” fractional reserve banking as well as central banks for the business cycle. As we have seen, he thought fractional reserve banking was some alien and anti-market addition to a pristine, wonderful and pure form of capitalism. Rothbard was laughably wrong here. It is particularly absurd because it never seems to have occurred to Rothbard that the idea that the cause of business cycles lies within capitalism was actually a view of Hayek! According to the logic of the ABCT, since capitalism naturally has an endogenous/elastic money supply, not only from fractional reserve banking, but also from things as simple as bills of exchange and promissory notes, it will be hit by perpetual business cycles. Capitalism has an inherent and natural tendency to produce such destabilising cycles. In other words, Hayek’s theory in the 1930s was seen as a pessimistic criticism of capitalism as inherently flawed that naturally attracted people sympathetic to socialism – a point that splendidly confirms everything I have been arguing here. Austrian economics has a profoundly anti-capitalist mentality, and they should admit this instead of denying the heart and soul of their theory, like the delusional idiot Rothbard. So, to all Austrians everywhere, it seems to me you need to come out of the closet and embrace your inner and suppressed hatred of capitalism. I’m sure you’ll feel a lot better when you admit to being the filthy anti-capitalist you really are. The talk below by Steve Keen is the first lecture in his introductory subject “Becoming an Economist” at Kingston University (in the UK), though personally I wish he had not shown that stupid rap video about Keynes and Hayek, which shows very little except that the tiresome libertarians who made it do not understand Keynes’ thought. This is a lecture by Bill Mitchell given at the University of Helsinki on Friday, October 9, 2015. He discusses the Eurozone crisis and austerity. Some more background is here. It doesn’t matter how many times Rothbard’s view of the 1870s is refuted, Austrians and libertarians simply continue to shun reality and repeat Rothbard’s errors (such as here and here). It can’t hurt to review the data. First, industrial production. The best and most recent index of US industrial production in this era is Davis (2004) (see Hanes 2013: 121), which draws on many more industrial products and services than other, older indices. 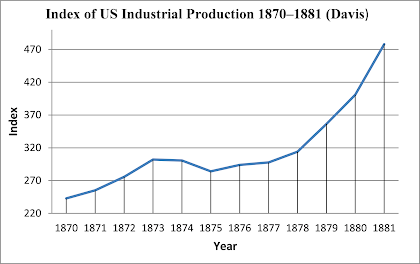 Even in 1877 US industrial production remained below its 1873 peak. 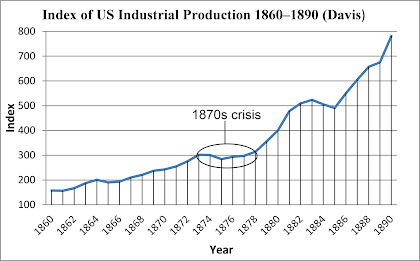 On the basis of this data, Davis argued that there was a recession in the US probably from 1873 to 1875. Strangely, the real GDP estimates in Balke and Gordon (1989) only show a recession in 1874 in this decade, but Davis’s data clearly are a much better guide to what was happening in the US industrial sector then Balke and Gordon’s work, and we should go with Davis. The data on US industrial production are best seen in the graphs below. As we can see in the graph above, the recession and stagnation in industrial production from 1873 to 1877 are clearly visible as compared with the ten years of growth both before and after this period. 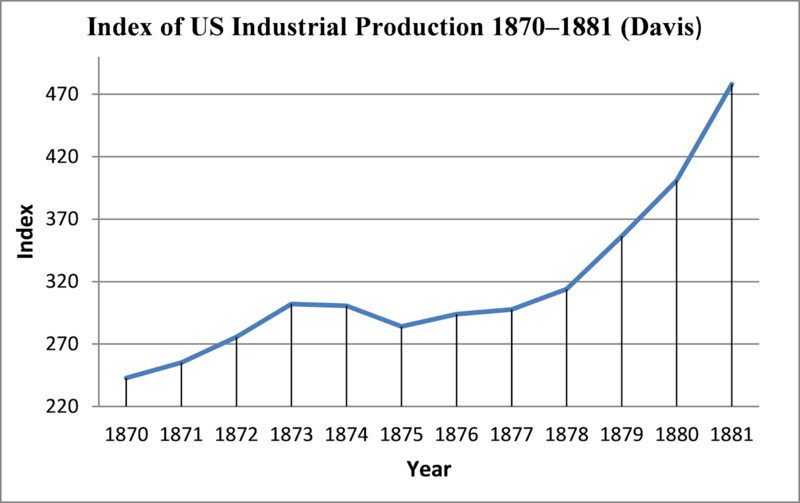 We can also see that the serious take-off in the recovery of industrial production only happened from 1878. 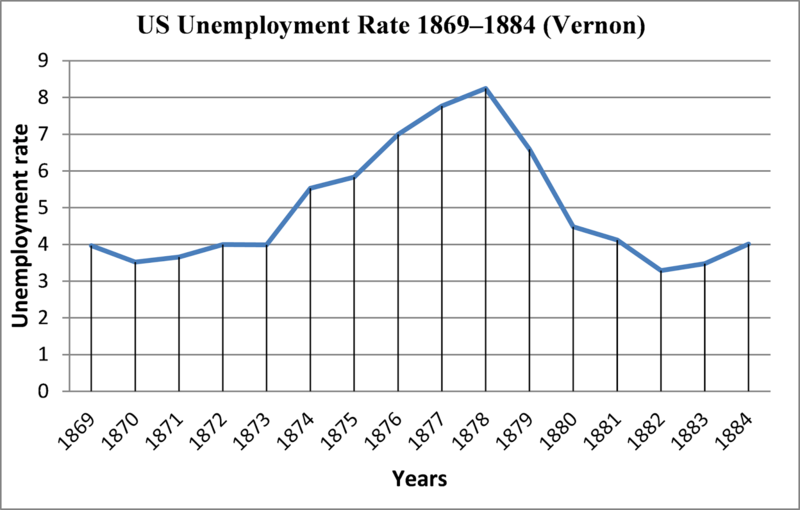 It is evident, then, that something went badly wrong with US industrial production from 1873 to 1877, and this is confirmed by the unemployment estimates from this period from Vernon (1994). As we see here, unemployment was rising from 1873 and kept on rising until 1878. That would strongly confirm that the US economy was in recession in these years or at the very least was stagnating (another point is that, on the basis of analysis of the 1890s and the likelihood that 19th century labour force participation rates were countercyclical in the sense of rising during recessions, there is at least a reasonable case that Vernon’s data seriously underestimates US unemployment in the 19th century, so that the real unemployment rate for the 1870s may have been considerably higher). All in all, then, it is not possible to claim that the US economy was booming in these years. “Yet what sort of ‘depression’ is it which saw an extraordinarily large expansion of industry, of railroads, of physical output, of net national product, or real per capita income.” (Rothbard 2002: 154–155). Of course, if one wants to define “depression” as a fall in real GDP of 10% or more (a definition which I accept), then it is likely that the 1873 to 1879 period was not an era of depression. Rather, it was most likely a period of serious recession (where “recession” means a fall in real GDP of less than 10%) and then stagnation of industrial production and rising unemployment, and probably pessimistic business expectations leading to deficient investment. (1) there was no large expansion of industry in this period: our best data shows industrial production was in recession from 1873 and then stagnated until 1877. Indeed for the 1870s as a whole there were 4 years in 1873, 1874, 1875 and 1877 when industrial production was in recession or essentially stagnating. (2) if industrial production was in crisis, then it is very difficult to see how there could have been a “large expansion” of “physical output” or “net national product” in these years, despite the real GDP estimates of Balke and Gordon (1989: 84): they estimate that average real GDP growth from 1873 to 1877 was 2.8% (which in any case is far lower than Rothbard’s estimate). If real GDP was experiencing such growth rates, one must ask: which sectors were growing? Clearly the industrial sector was not. (3) there was no “extraordinarily large expansion of … real per capita income” in the relevant period. Even if one accepts the estimates of Balke and Gordon (in Maddison 2006: 87–89) the average real per capita GDP growth rate from 1873–1879 and even from 1871–1880 was just 1.64%: one of the lowest growth rates of all time in relevant periods of economic and historical significance in US history. 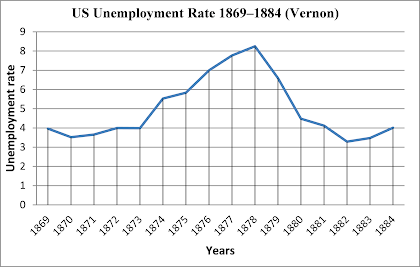 (4) finally Rothbard never considered unemployment, which by one influential modern estimate by Vernon (1994) began rising from 1873 and kept on rising until 1878. Our inescapable conclusion is that the Austrian claim – derived from Rothbard – that the 1870s were an uninterrupted era of “prosperity …[,] economic growth, and the spread of the increased living standards” is an outright historical travesty. And while Rothbard might claim that he did the best with the data he had at the time (e.g., older and now discredited data from Friedman and Schwartz 1963), that is no excuse for modern Austrians repeating his false and flawed analysis today. Newman, Patrick. 2014. “The Depression of 1873–1879: An Austrian Perspective,” Quarterly Journal of Austrian Economics17.4: 474–509. I find the libertarian obsession with Paul Krugman to be both boring and bizarre. And now Robert Murphy, along with another Austrian called Tom Woods, has launched a “Contra Krugman” show, dedicated to debunking Krugman’s column regularly. Paul Krugman, “Debt Is Good,” August 21, 2015. I want to focus on Tom Woods’ serious historical error below, one which seems to be peddled endlessly by libertarians. (3) that this was sustained and not punctuated by long periods of serious economic crisis. This is simply wrong. First of all, there were extended and very serious periods of economic crisis and recession in the 1870s and 1890s, with high unemployment, as well as shocked business expectations (caused by price deflation and sticky wages), profit deflation and debt deflation (see here and here). 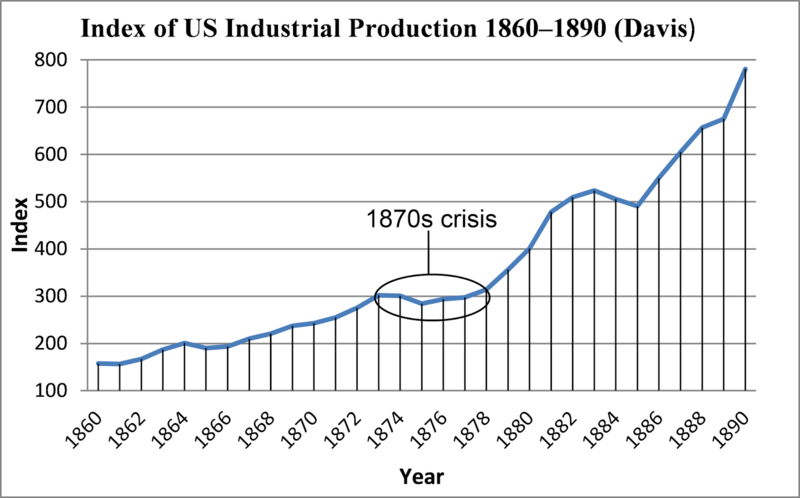 For example, in the 1870s America was hit by a recession probably from 1873 to 1875 (Davis 2006: 106) and then soaring unemployment and stagnation of industrial production down to 1877 (see also here). Furthermore, the whole deflationary period from 1873 to 1896 seems to have suffered from deficient investment and debt deflationary crisis (see here). So to speak of the growth being “sustained” is a distortion of reality: in truth, it was punctuated by many years of crisis in the 1870s and 1890s. Secondly, was it really the highest growth rate in US history? This claim about 1870–1914 is wrong and a libertarian myth, the same myth peddled by Peter Schiff here. (12) Average annual real GDP rate 1974–2001: 2.963%. Of course, it is reasonable to remove World War II from our list, since here real GDP growth mainly represented wartime matériel production. But even if remove WWII, as we can see, the 1870–1913 or 1871–1913 period was beaten out by (1) the recovery from Depression (1934–1940), (2) roaring ’20s (1922–1929), (3) the Reagan boom (1983–1989), and the golden age of Keynesianism (1950–1973). As we see here, in terms of average real per capita GDP, the 1871–1914 and 1873–1896 (the great deflation of the 19th century) periods were the worst in our list, and real per capita GDP is a better measure of the per capita wealth in an economy. In contrast, from 1948 to 2001 in a period of 53 years (longer than the 1870 to 1914 period), the real average US per capita GDP growth rate was 2.168%, obviously better than the period that libertarians are obsessed with. We should also note well that unemployment in the 19th century was much worse than in the modern era after 1945 when modern monetary and fiscal interventions became normal, as we see here. So much for ignorant libertarian myths about this period. here for more on this). The ABCT is also discredited by the empirical evidence. The ABCT says that new unsustainable capital projects initiated in the boom are liquidated and that this drives the bust. However, a great deal of the fluctuations in output and employment during recessions are caused by changes in capacity utilisation at mature firms and businesses, often connected with the need to liquidate inventory. This is what often characterises and drives the fall in investment – not liquidation of new projects (on these points, see here, here, here). “Keynes on Inventories and the Business Cycle,” September 27, 2014. “My Links on the Deflation of 1873 to 1896,” February 24, 2015.